Bordering Botswana, Hwange National Park is Zimbabwe’s largest national park and covers an area of 14,600km². Its massive size leads to varying landscape, game, and wild bush. 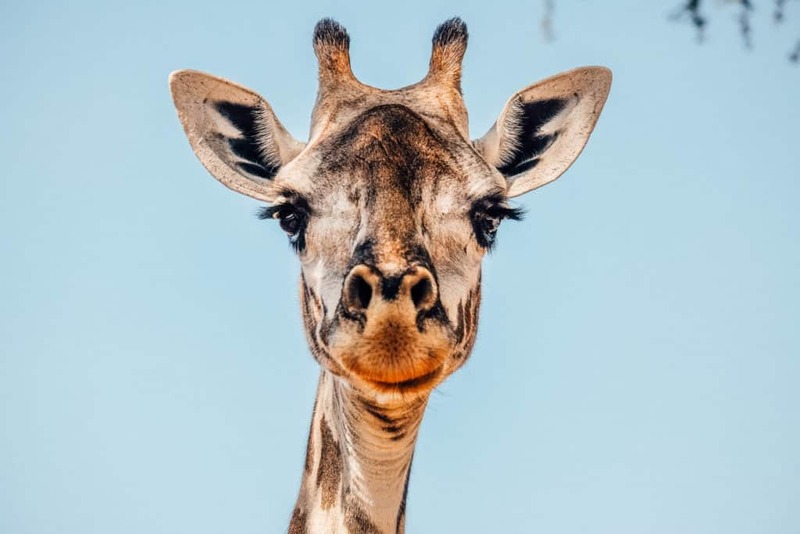 The park moves from desert scrubs on the edge of the Kalahari in the south, to granite hills and woodlands filled with mopane and teak in the North. One characteristic that will strike all visitors in Hwange is the importance of water. The park’s large population of wildlife is sustained by managed water holes, or pans. 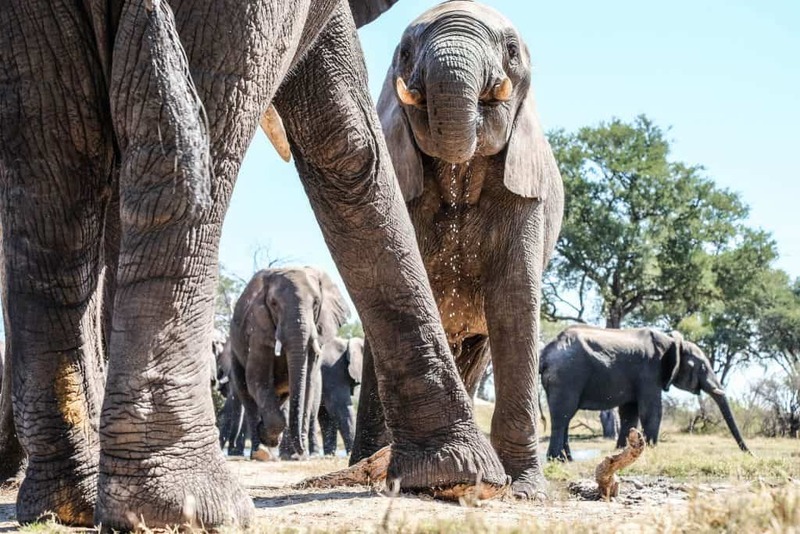 Nearly 100 mammal species call Hwange National Park home. That includes all of the big five animals, even the endangered rhinoceros. The park is easily accessible and full of the highest numbers of animals. These are best spotted in the dry season (August to October) when the wildlife congregates around the shrunken water holes. We landed in Hwange National Park after a two-hour flight with Wilderness Air coming from an awesome safari in Mana Pools National Park, Zimbabwe. It was a long ride in a small Cessna 206 so were relieved when we landed in the park. Our guide Luke greeted us at the airstrip and took us away to our first camp in Hwange National Park, Little Makalolo. Little Makalolo is a classic style safari camp. A small main lounge, bar, and dining area with a fire pit as the central feature. We settled right into camp and took some time to ourselves after the long journey. It’s amazing how a shower, a cup of coffee, and the sounds of the bush can revitalize a weary traveler. Our first evening out was a relaxing game drive. We found ourselves winding through thick bush and deep sandy tracks. The park was starting to dry and out and a few trees had dropped their leaves. However, the vegetation was still thick and the wildlife was dispersed throughout the park. None of this stopped us from having phenomenal wildlife sightings. 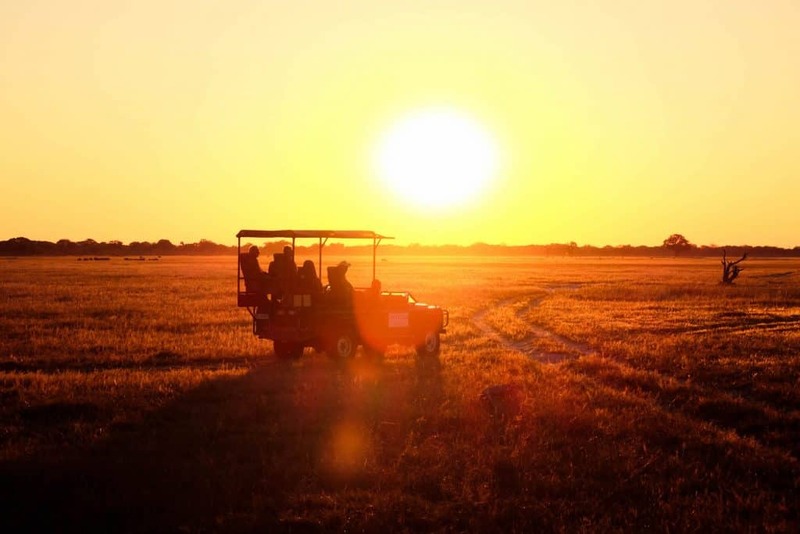 It was the kind of safari experience and sightings that only a park like Hwange can deliver. 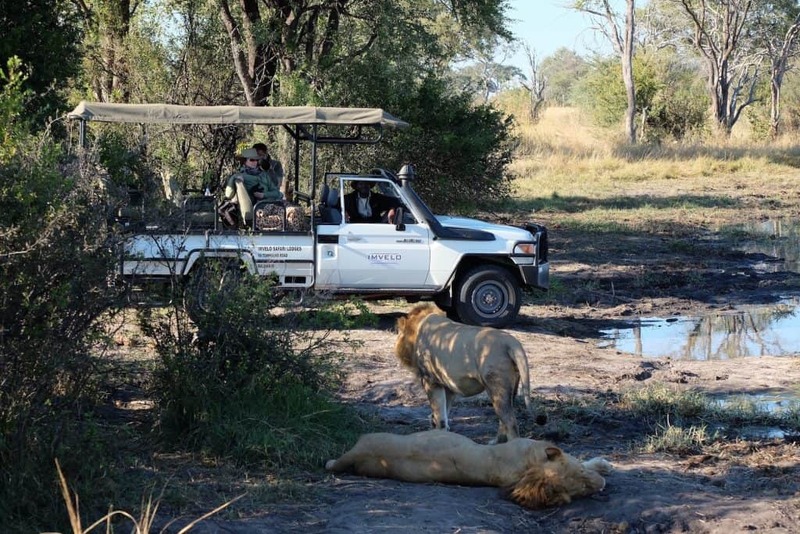 We saw majestic male lions who are decedents of the famous Cecil the lion, a pack of nine African wild dogs, cheetahs, hundreds of elephants, kudu, and a side-striped jackal. 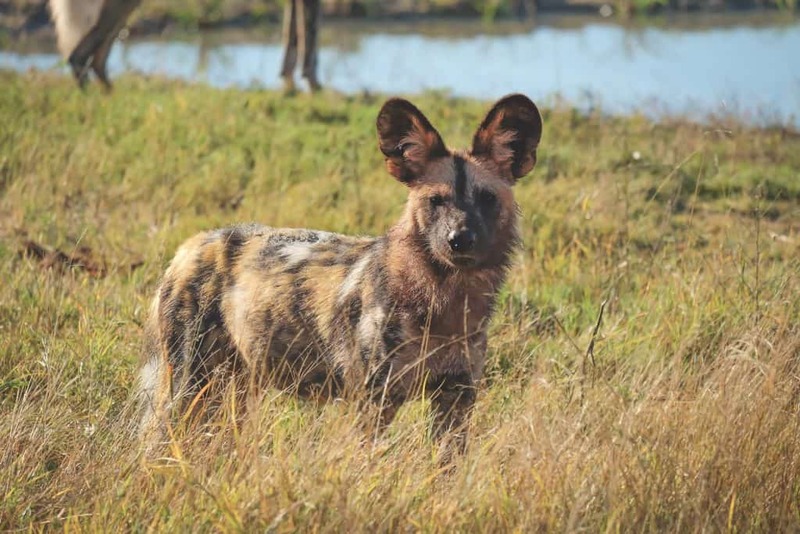 It would be tough to compete with the wild dog hunt we saw on day two, but then we moved to Imvelo Safaris. On our first day with Imvelo, our guide surprised us with a bush lunch and an afternoon of sitting in their photographic hide. The hide is exclusive to Imvelo and is essentially a shipping container buried next to a watering hole. Upon settling in the hide our guide turned on the pump and fresh water started to pour out from in front of the hide. A short while later we had elephants towering over us from a few meters away. It was and is the closest we’ve ever been to such a large herd of elephants. 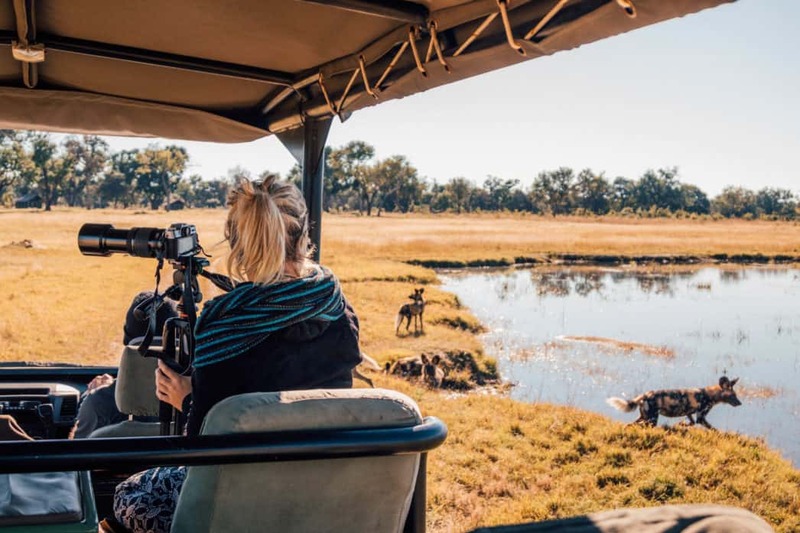 When is the Best Time to Visit Hwange National Park? Spotting wildlife in Hwange, like most parks in Africa, is best in the dry season. The dry season in Zimbabwe and Hwange is at its peak from late June – October. The dry season makes it easy to spot animals in the bush as they concentrate around sources of water. 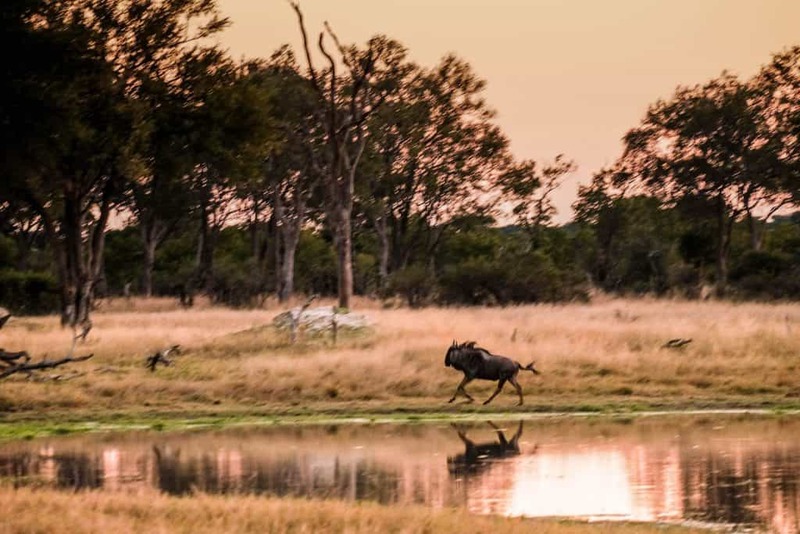 Water is a precious resource in Hwange as the large majority of water holes are managed by pumps year round to help maintain the animal population. December to March is the green season. Rains begin to fall in November and by December most wildlife disperses in the park with increasing foliage providing greater camouflage. There is a brief shoulder season in May before the peak season arrives in June. 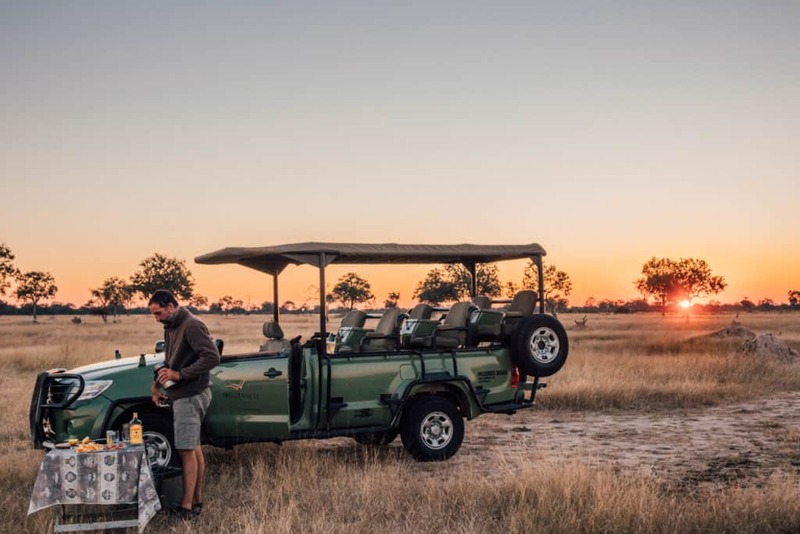 It is an anomaly in comparison to the rest of Zimbabwe as tourism in the park is in high demand and many of the lodges fill up completely during peak season. The National Park is open all year round. National parks in Zimbabwe are similar to many parks in Southern Africa and are very affordable. Hwange National Park is the largest park in Zimbabwe and one of the largest in Africa. Its name comes from the local chief at the time of its formation in 1929. The park is located in the Northwest of Zimbabwe and borders Botswana. It is only a one hour drive south from Victoria Falls which makes it the perfect safari add on to the falls. 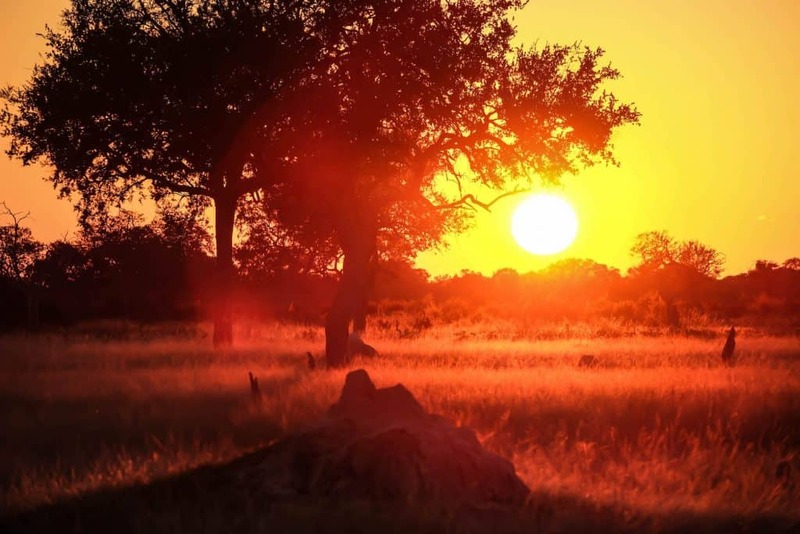 Hwange’s landscape is a combination of Kalahari sand, woodlands, and teak forests. It’s even common for the lodges to use the teak as firewood as no wood is allowed to leave the park. The landscape has wide grass plains fringed by palm trees and acacias. The diverse landscape and abundance of food support large herds of elephant and Cape buffalo. However, in recent years the elephant population appears to be out of control destroying large woodland sections. Hwange has an incredible amount of wildlife with over 100 species of mammals and almost 400 bird species. 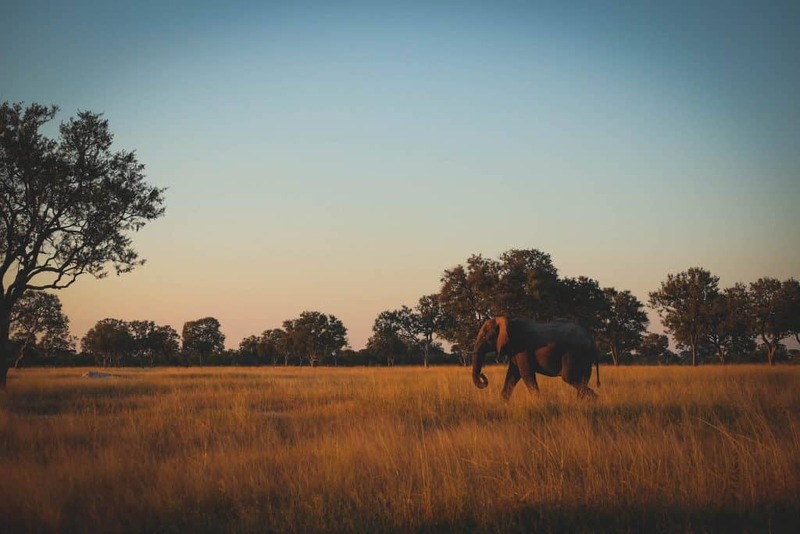 The park contains one of the largest elephant populations in the world and visitors are sure to have more than their fair share of close encounters with the animal. Hwange National Park is also well known for its predators, with good numbers of lion, leopard, cheetah, and wild dog. 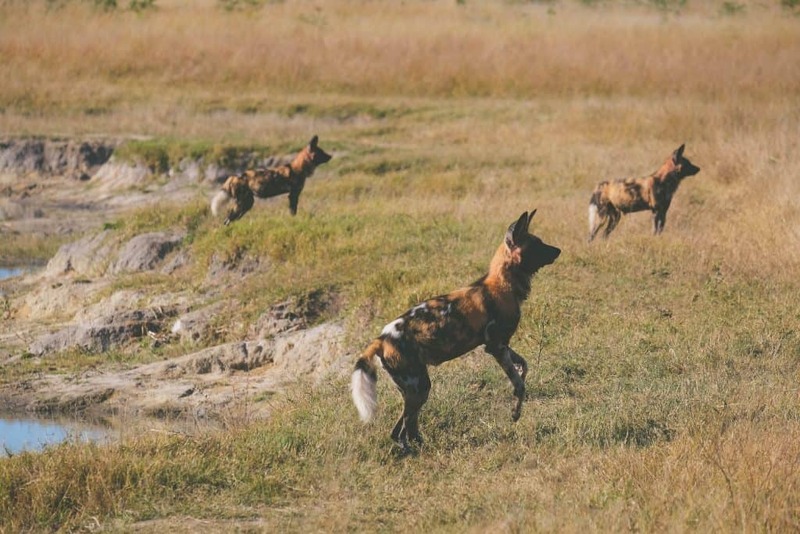 We were exceptionally lucky in seeing a wild dog hunt and kill on one of our first days in the park. 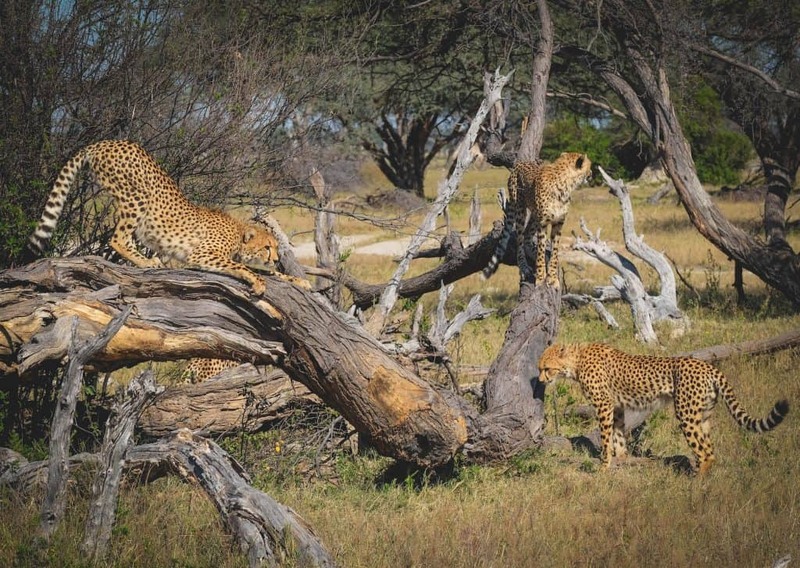 Other highlights for us included a large coalition of five cheetahs and even a lion kill. Other rare animals that are regularly spotted in the park are the roan and sable antelope. We stayed with Wilderness Safaris in Mana Pools National Park and absolutely fell in love with their camps. 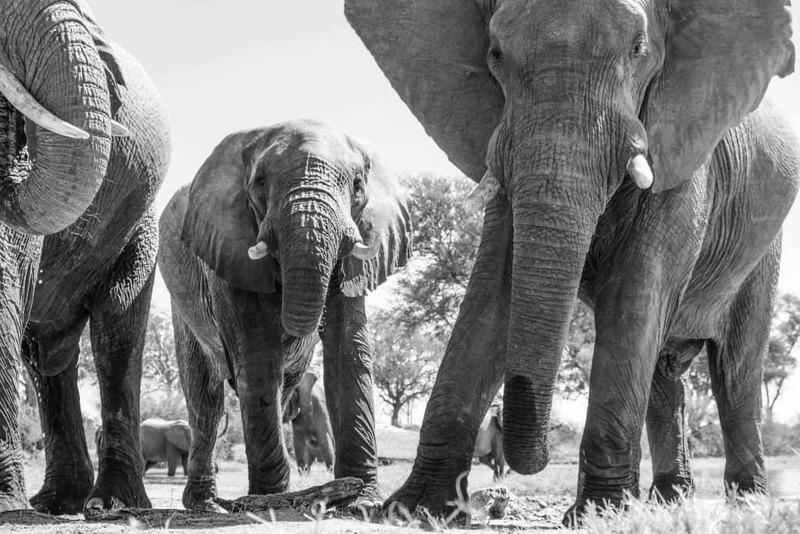 We were more than excited to experience their Little Makalolo camp while in Hwange. 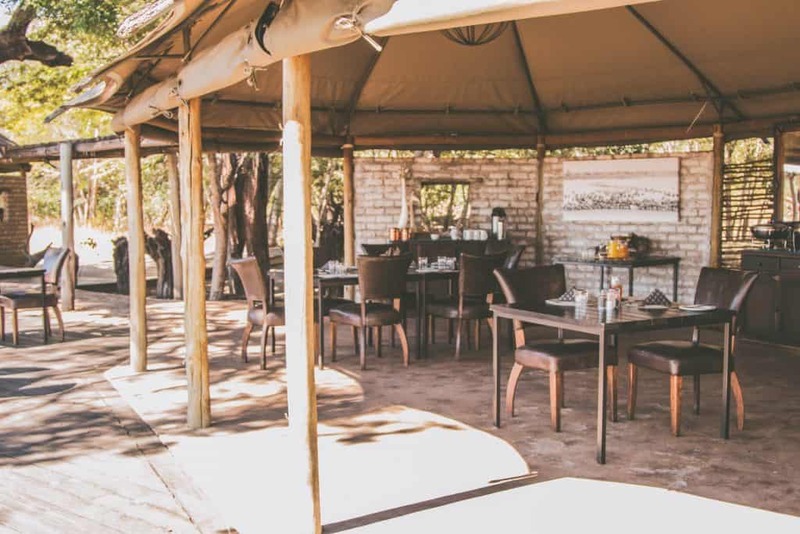 Little Makalolo is special as it was one a few private camps located within Hwange National Park. 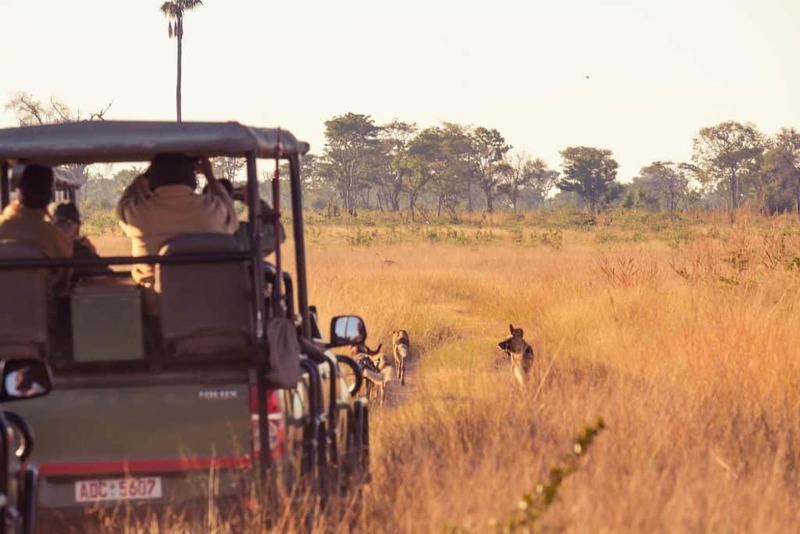 Wilderness Safaris enjoys a large concession for their sole exclusive use within the national park. It serves well for those looking to disconnect from the modern world and reconnect with the bush. Little Makalolo, or “Little Mack” is a small camp with only six tents and a private waterhole with an above ground hide. The six tents are connected via a teak walkway. On the two nights we stayed we saw a side-striped jackal and a hyena on the path, and felt reassured to have guides walking with us at night. 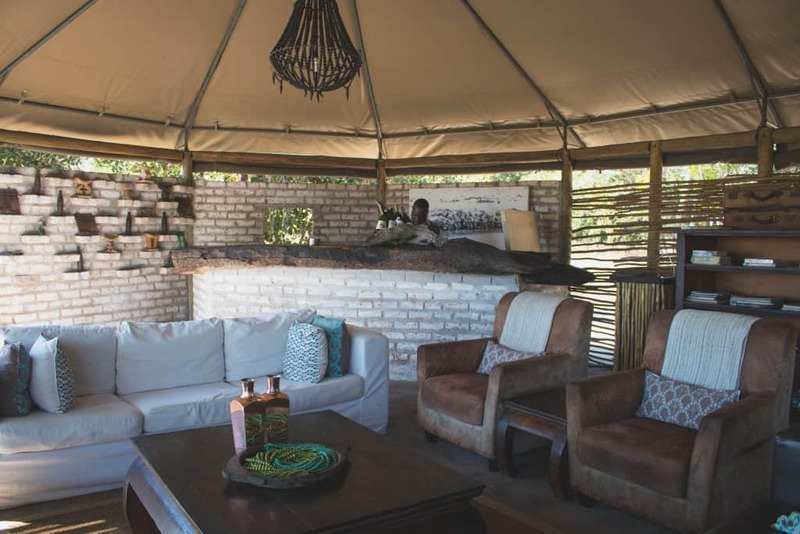 The center of the camp is a false mopane tree that provides shade during the day and serves as a dramatic backdrop to the large fire pit. There’s no WiFi at Little Mack and only small solar lights in the tents. The large tents are built in the shade of large trees, with outer walls to allow the flow of wind and cool cement floors. Each tent has a large en-suite bathroom, with full plumbing and hot water. The rooms also include indoor and outdoor showers, as well as one honeymoon tent with a bathtub. While the camp has a plunge pool it was much too cold for us to enjoy, but we’ve told it’s a highlight come September/October when temperatures in Southern Africa skyrocket. The tents are all shaded by a wooded area and it helps keep the tents cool during the day. All of the tents sit at ground level nestled down tree lines that look out towards a wonderful waterhole. 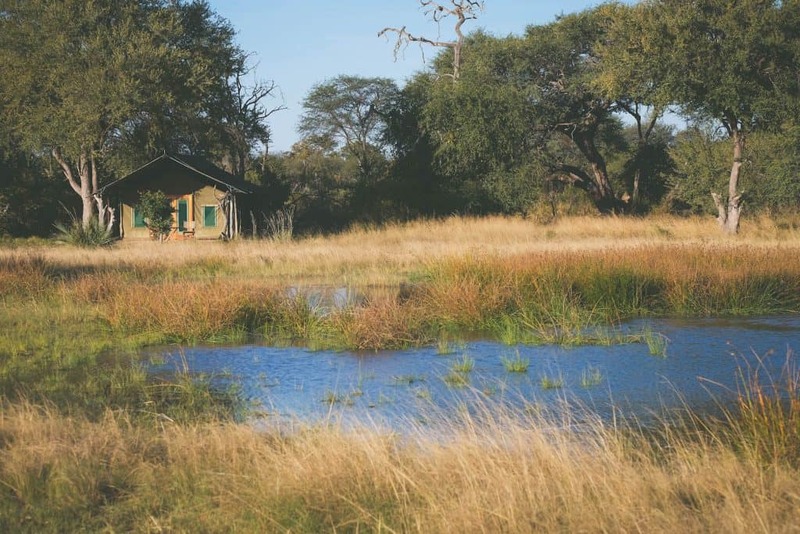 Guests can sit in camp or the hide at the waterhole and have amazing wildlife sightings. Large herds of buffalo and elephants are known to frequent the waterhole providing guests a show from the tents. For us, the highlight of Little Makalolo is the central deck and fire pit. On the cool evenings in late May we enjoyed sitting around the fire with a glass of Amarula and listening to the sounds of the bush. We stayed at two separate lodges with Imvelo Safaris. They have a private concession just outside the park and two famous lions referred to as the Bomani Brothers like to hang around the region. They’re a beautiful pair and they are likely the offspring of the famous Cecil the Lion (Cecil and his brother both mated with the mother). 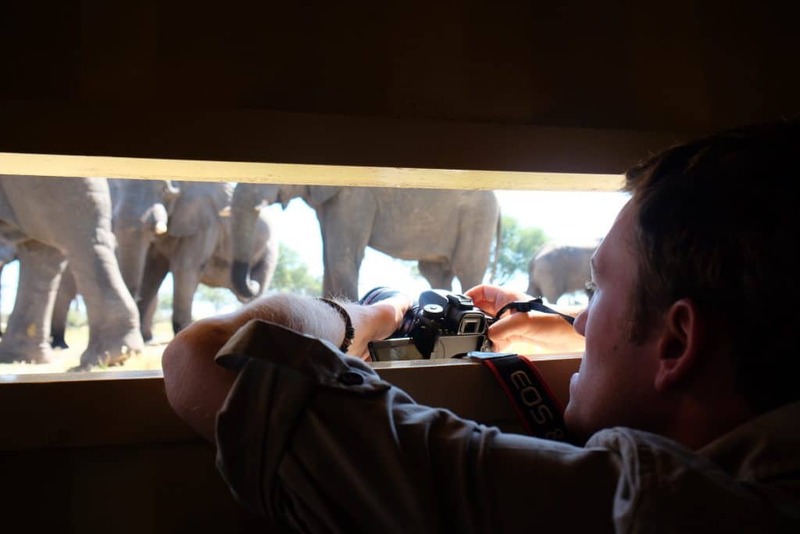 Imvelo Safaris also operates Stofies Hide which is an exceptional place to get photos. 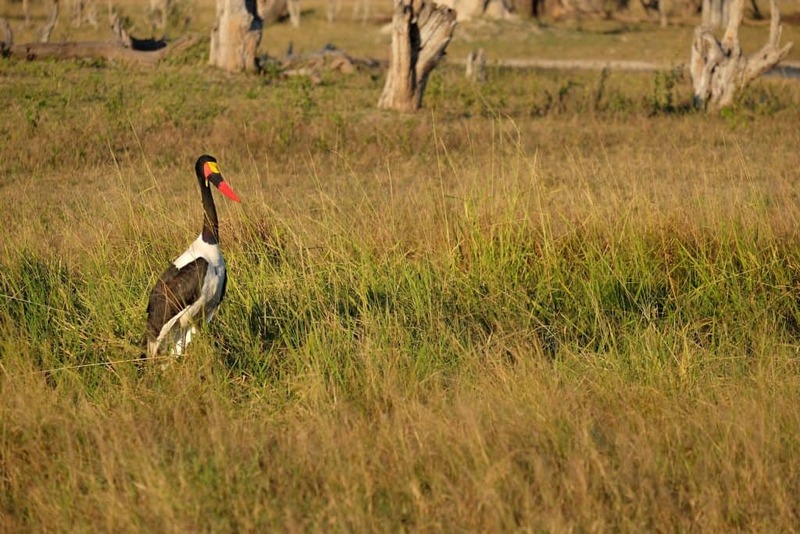 The hide is one of the only ones of its stature in Zimbabwe. Imvelo Safaris is responsible for managing the pan as well as many other in the park. They pay to run the pumps and it’s a crucial element in the conservation of the park. Camelthorn is situated in woodlands just south of Ngamo’s famous Plains. The lodge is located outside the park in community lands, but the drive to the main gate takes less than five minutes. The rooms at Camelthorn are some of the largest we have seen for a safari lodge. The large rooms are concrete buildings with massive bathrooms, a fireplace, lounge, and a second story deck. We felt extremely comfortable at Camelthorn and after some time in a tent, it felt nice to be in a more sturdy structure. Meals at Camelthorn are a communal affair and we enjoyed the large bar, communal area, and fire pit at night with our fellow safari goers. Bomani Tented Lodge is more in line with a traditional safari camp with large tents on a pan. The camp lies in the private Bomani concession. The area is surrounded by large plains that and the camp often sees massive buffalo and elephant herds at the watering hole. The main lodge sits on the Bomani pan and consists of a dining room, lounge, and bar, built on a raised viewing platform. Not far from the pan’s edge lies the camps fire pit the perfect place to relax after sundown. The Bomani camp staff were wonderful in preparing us a special candlelit dinner outside our room while listening to the sounds of hyena in the distance. What’s a typical day on safari in Hwange like? 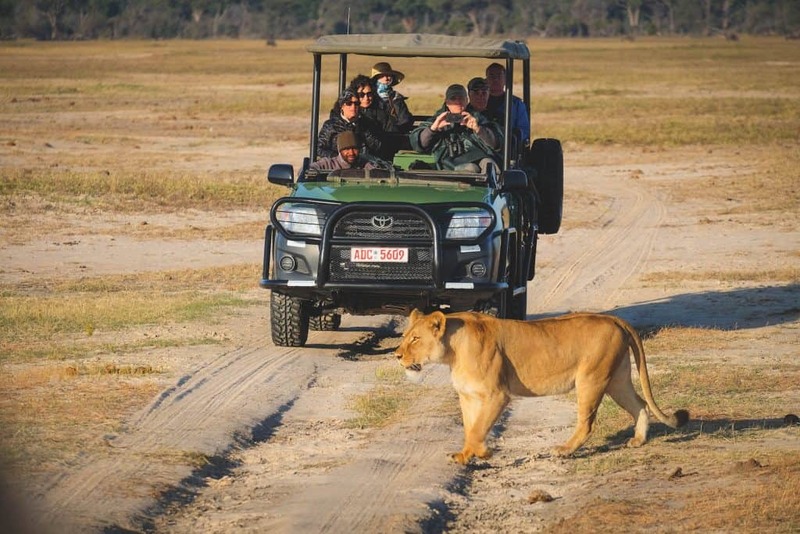 Check Out Zimbabwe Safari Tours! Visas for Americans traveling to Zimbabwe cost $30 USD payable in cash at the border. Visas are good for 30 days. Americans have the cheapest visas while the Canadians and Brits have it the worst at $75 and $55 respectively. More info on visas here. As we were traveling between Zambia and Zimbabwe we opted for the recently released KAZA visa that is a dual visa good for both countries, it costs $50. The local meal in Zimbabwe is sadza and is a combination of maize, relish, and meat and it is delicious! We drove around Zimbabwe and love the people and the country. Read more about travel in Zimbabwe!